This pennant flag is the perfect way to show your allegiance to your favourite team and makes a great treat for yourself or gift for someone special. Your personalisation is merged with the stylish design and printed on the flag fabric. The pennant comes with 2 brass eyelets and 2 cable ties. 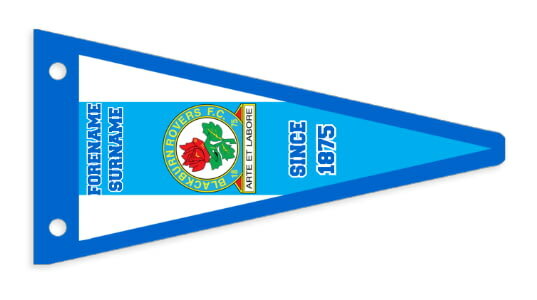 This is a fabulous present for any Blackburn Rovers FC fan and is approved and fully licensed by Blackburn Rovers FC. Our personalised 100% Blackburn Rovers FC mug is a great present for any Blackburn Rovers FC fan! Our personalised Street Sign Mug is a fabulous present for any Blackburn Rovers FC fan and is approved and fully licensed by the club.